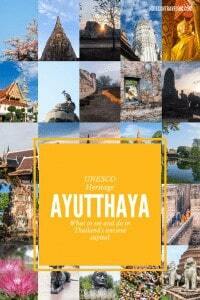 Today, UNESCO World Heritage Site Ayutthaya is a sleepy town about 70 km north of Bangkok. But 250 years ago it was the capital of Siam (Thailand) with grand architecture and a sprawling trade with all corners of Asia and even with some of the European royal courts. As it is custom, each of the kings not only had the royal palace improved but also new temples built. 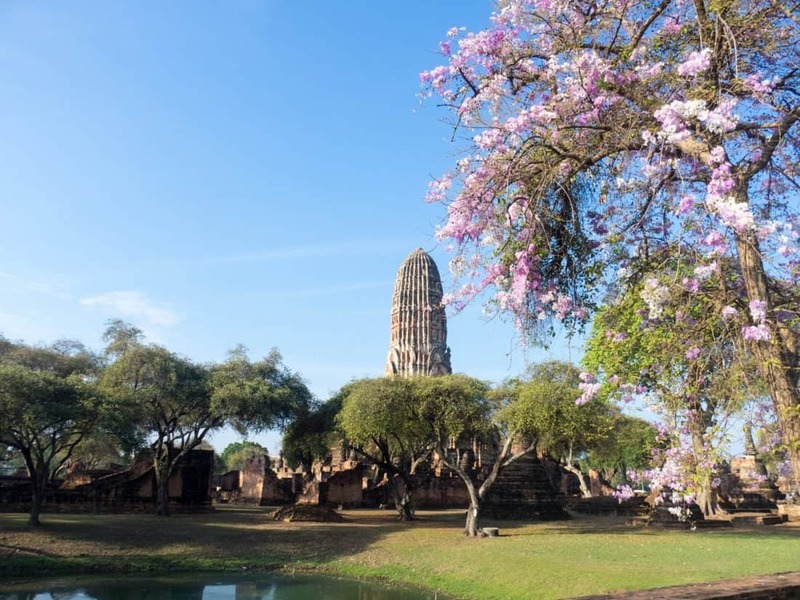 Founded in 1351, the architecture of the Ayutthaya Kingdom incorporated Khmer (Cambodian and Hindu) influences. But comparisons with the Angkor temples fall short. Not only is Ayutthaya younger, but the sites are also a lot smaller, and the construction with red brick covered in stucco for ornate decorations means that only comparatively few elements remain. Also, Ayutthaya has always been a living city — even after 1767, when the Burmese conquered the city and burned it to the ground. While the Thai capital moved to Thonburi (today part of Bangkok), the Burmese had to withdraw back North within months to fight off the Chinese forces about to conquer their capital. So Ayutthaya was rebuilt as a smaller version of its former royal self. Subsequently, the temples didn’t get swallowed by the jungle. They simply fell into disrepair. 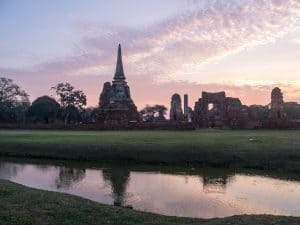 One of the largest prangs in the Ayutthaya Historical Park collapsed only 100 years ago — recent enough for photographs of the before to exist! What’s a prang, you ask? I’m glad you brought it up! 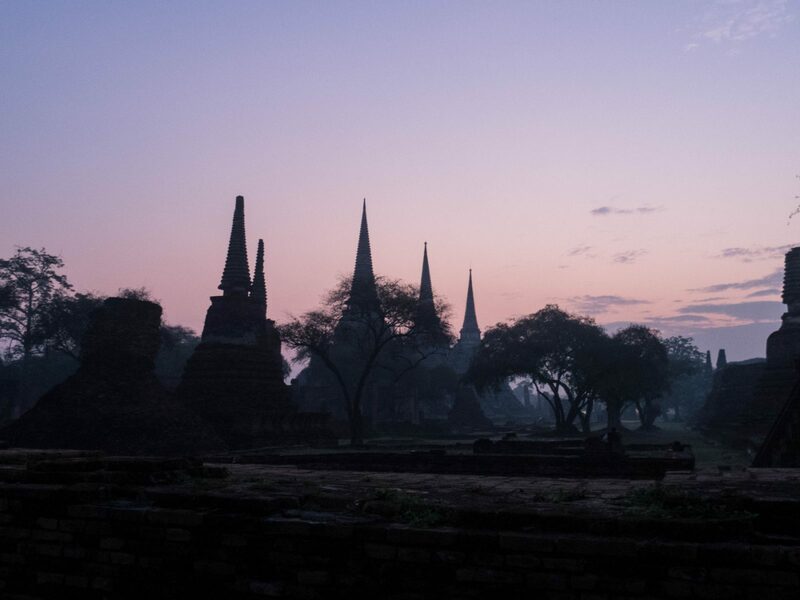 There are two types of buildings that remain of the Ayutthaya temples: prangs and stupas. Prang (the large cucumber shaped pagodas) – A prang (Khmer: ប្រាង្គ) is a tall tower-like spire, usually richly carved. They were a common shrine element of Hindu and Buddhist architecture in the Khmer Empire. 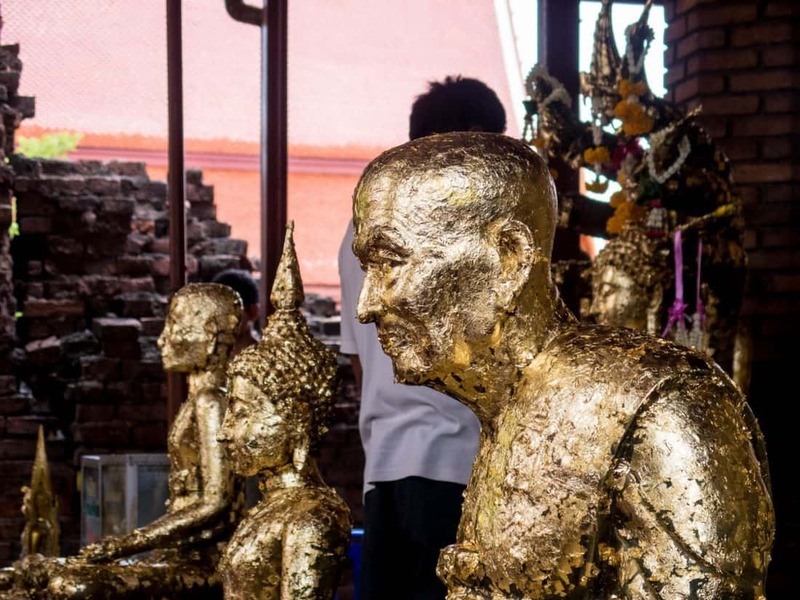 They were later adapted by Buddhist builders in Thailand, especially during the Ayutthaya Kingdom (1350–1767) and Rattanakosin Kingdom (1782-1932). In Thailand, it appears only with the most important Buddhist temples. Stupa (the pointy pagodas) – A stupa (Sanskrit: m.,स्तूप “heap”) is a mound-like or hemispherical structure containing relics (śarīra – typically the remains of Buddhist monks or nuns) that is used as a place of meditation. The buildings are mostly made of red brick with a base of shaped blocks of rock, covered with stucco to create vivid details. Even the large Buddha sculptures have been built in that style. There are dozens of smaller and bigger temple complexes in the old city of Ayutthaya — that is an island formed by the large Chao Praya River, upstream from Bangkok, the smaller Pa Sak, and the Muang channel connecting the two — and in the surrounding area. The city, of course, has itself long spilled across the rivers and stretches for several kilometers. 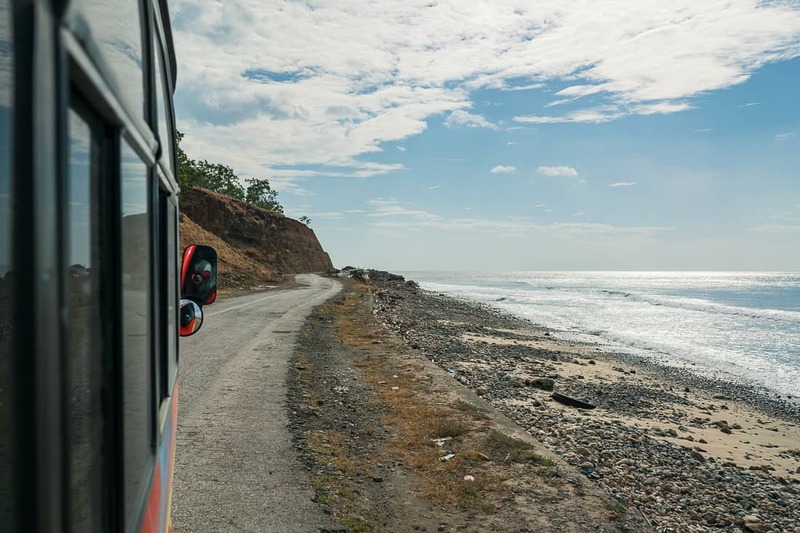 I recommend either renting a bike just to go out and explore (maps should be available at your accommodation of choice) or to rent a tuk-tuk for the day and have the driver take you to the sights. Note, that while the land is flat, it is Thailand after all and temperatures can reach the high-30s °C in the scorching sun. 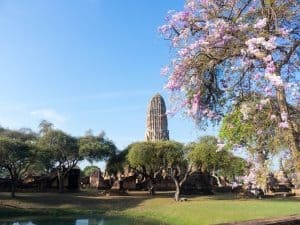 But for your convenience, I have whittled down the list to my ten favorite temples plus two more unmissable Ayutthaya sights. I recommend going out for explorations in the first morning light (that’s before 6 am). Most temples don’t open before 8. However, there are always openings in the walls. So you can sneak inside and simply pay your entrance fee when you leave after 8. If you are looking for practical information, make sure to scroll down to the end of this post. Click on the gray star next to the map title to show the map markers in your regular Google Maps view. Click on the markers to reveal what’s what. When approaching this temple from the water, you’ll notice people throwing chunks of bread into the water and giant catfish stumbling over one another to catch it. The fish are holy to the people praying at Phananchoengworawihan. So don’t even think about getting your fishing rod out. The first thing I noticed, approaching this temple from the water was an array of roosters announcing the coming new year of the rooster. Entrance to the temple is free (donations encouraged). Leaving the roosters to the right, I entered the old part of Wat Phutthaisawan. A colonnaded courtyard reminded me of Christian cloisters. Just that it was lined with dozens and dozens of serenely sitting Buddhas. In the center of the courtyard are some white prang guarded by cobras. Don’t forget to step all the way through the courtyard. On the other side is a big reclining Buddha, protected by brick walls with windows. Traditionally, the large Buddha sculptures were never covered with a roof. Note, that you cannot get anywhere near the water on the other side of the river for a sunset view of Chai Watthanaram as the land over there is all privately owned. This is probably the most famous image from Ayutthaya: The beautiful face of a Buddha looking through the roots of a Bodhi tree. To get the best shots, you want to arrive early (the temple opens at 8). As you can see from this 8 am shot: the morning light highlights [sic!] the serenity of the moment. Don’t miss the rest of this temple complex: a few steps on there is a very well kept sitting Buddha. Wat Mahatat is included in the 6-temple ticket and costs 50 Baht for an individual ticket. If you want to be super-cheap, you can also get a peak of the Buddha’s head from the outside from Chikun Alley. The big Wat Ratchaburana prang is visible from almost everywhere in Ayutthaya. You can also climb it and then climb down on the inside (cue to claustrophobia) to see some of the last remaining murals in the Ayutthaya temples. Another iconic Ayutthaya image is the line of stupas in Wat Phra Si Sanphet. The can not only be climbed (though the insides smell heavily of pigeon and bat manure), they also make a beautiful ensemble when shot from outside the walls at sunrise or sunset. Wat Yai Chaimongol is a bit out of the way. It took me 45 minutes to walk there. But you can either get a bike or a tuk-tuk. Because it is worth the journey. The temple is very active and the old structures extremely well maintained. So you not only get a better idea of what the rest of ancient Ayutthaya might once have looked like, but you can also observe Buddhist practice. 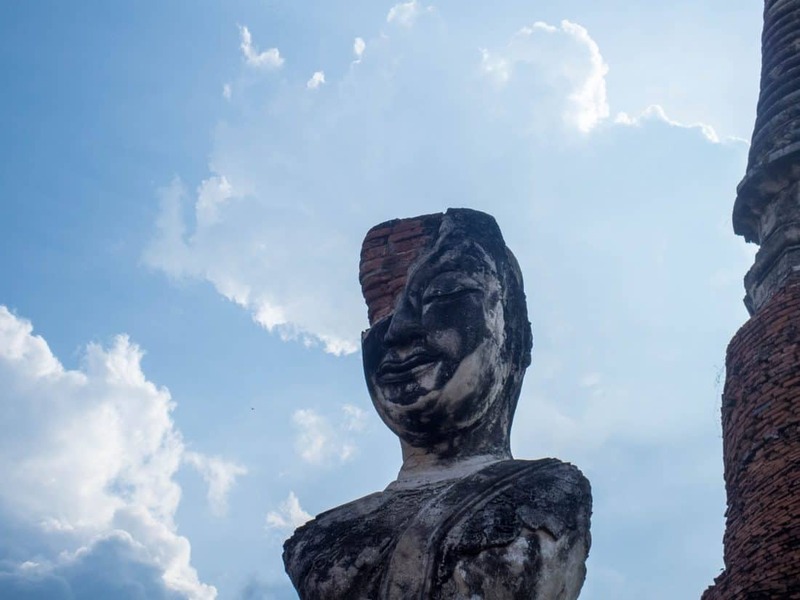 Upon entering you first see another giant reclining Buddha surrounded by a brick wall. However, there are no windows allowing for nicely framed shots. The main complex is a prang worth scaling, surrounded by numerous large and smaller sitting Buddhas, often clad in orange cloth. Next to it is a large prayer hall, where Buddhist will attach goldleaf to Buddha statues or cast sticks to learn their fate. I’ll put a video on my Facebook page so you can get an impression of the proceedings. Finally, there is a large pond with lotus flowers and holy turtles. So don’t stick your feet in the water. Wat Thammikarat is the oldest temple on Ayutthaya island. 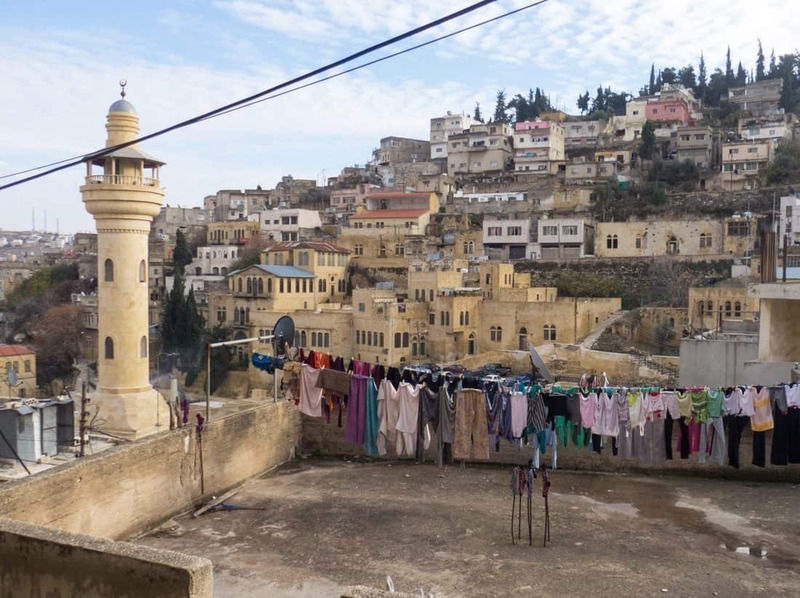 Over centuries, each king would add another building to the complex. This in itself is remarkable. 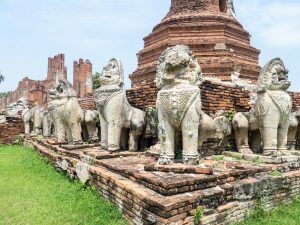 But Thammikarat has one feature you won’t find anywhere else: One of the pagodas is surrounded by a guard of lions (the same style you’d find in Angkor). Entrance fee is 20 Baht plus 20 Baht to go inside the large prayer hall, where a cheerful young monk will happily tell you the story of Thammikarat. This is a great sunset spot if you find the right angle. Reclining Buddha sculptures look into the sunset. So you can get the orange ball of the rising sun to be exactly in the neck of Buddha. A very small site but worth the short detour, Wat Suwandawas allows you to see the handcraft behind creating the thousands of Buddha sculptures in Ayutthaya. Some historians say that large parts of Ayutthaya island were once a swamp, but the kings had the water channeled into large ponds. Rama Public Park is now freely accessible. 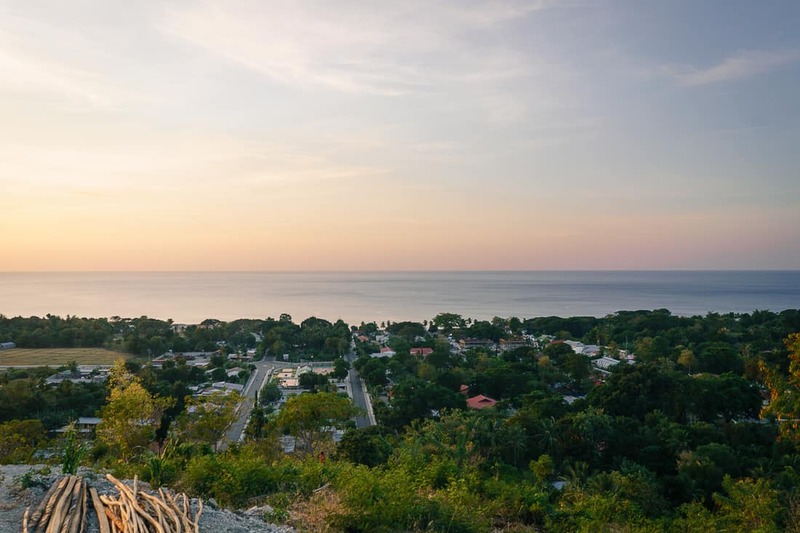 Stroll under ancient trees, discover smaller temples and watch the locals collect snails to be sold as a snack. For dinner, there is really only one place you should go in Ayutthaya: the night market. There are plenty of restaurants catering both to tourists and Thai people. But the night market is the preferred destination for both groups. You can get “harmless” fare like squid skewers or Pad Thai here as well as more local things like chicken foot salad or super-spicy fish stew. Keep your hands off the sushi, though: I wouldn’t be concerned about the ingredients. It’s just not good sushi. Come early, between 5:30 and 6:30 pm, and you’ll catch some of the delicious coconut puddings sold about half-way into the market in pretty little banana leaf bowls. Learn more about the history of UNESCO heritage site Ayutthaya on the official UNESCO website: whc.unesco.org/en/list/576. Dress code: Please remember that these are still temples, i.e. religious monuments. Therefore, appropriate dress is required: Your clothes (regardless of gender) should cover your shoulders and knees. You will not get kicked out, but you will get disgusted side eyes (and rightfully so). When entering operational temples, leave your shoes outside (flip-flops make the process easier). Train: The train is theoretically a super-easy way to visit Ayutthaya with the train station just outside the old town island and trains between Bangkok and Chiang Mai stopping here. Also, tickets cost as little as 20 Baht ($0.50) and can be bought right at Bangkok train station. However, due to frequent delays, the 70 km journey from Bangkok can easily take four, five hours, which makes this not a good destination for a day trip on public transport. Click here for a current schedule (ignore the prices, though). Note that the quickest access to the old town from the train station is via a short ferry connection: step outside the main station building, cross the street and go to the end of the alley. The fare is 5 Baht one-way. Train, getting far away: You can buy your ticket for the night train to the North (i.e. Chiang Mai) at the Ayutthaya train station. Bus: The bus is another easy way to get to Ayutthaya from Bangkok. However, note that the main bus terminal is several kilometers outside the historical town, and even though you see the flashy tourist buses cruise through the old town, they won’t pick you up there (drop-off is always subject to negotiation with the driver…). Boats: There is no regular ferry service along the Chao Phraya river. But if you have money to burn you can book a full-day cruise to take you from Bangkok to Ayutthaya, including food on board. I found prices around $60 (see for example ayutthaya-boat.com). Tours: Slightly cheaper are day tours from Bangkok to Ayutthaya by bus. However, I strongly recommend staying at least one night (and exploring the Historical Park during sunrise). I stayed at the Early Bird Hostel. 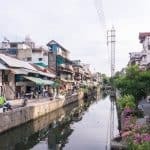 It’s a cute place with only two dorms, new and modern, tucked away behind the main road, about 10 minutes on foot from Wat Mahatat and the night market. Click here to browse Booking.com for more accommodation options in Ayutthaya. There is a combi ticket for six temples that are part of the Ayutthaya Archeological Park (aka Ayutthaya Historical Park). The ticket is valid for one month, costs 220 Baht ($5.50) and includes Mahatat, Phra Si Sanphet, Ratchaburana, Phra Ram, Chaiwattanaram, and Maheyong. Opening hours: Most temples are open daily from 8 am to 5 pm, but as mentioned above it is usually possible to sneak in outside opening hours. 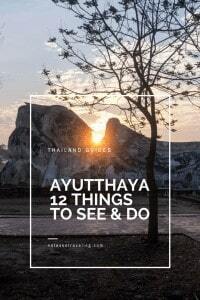 Since there is in official Ayutthaya Tourist Office website, it is best to get the current list (incl. opening hours) from your accommodation. Rent a bike: Most accommodations offer them for as little as $2/day. Rent a tuk-tuk (with driver): Subject to negotiation, you’re probably looking at about $20/day. 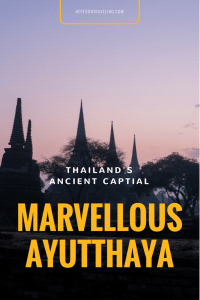 Because there is not remotely as much traffic as there is in Bangkok and because the roads are wide avenues, tuk-tuks in Ayutthaya are actually fun. River cruise: Boats leave every day at 4 in the afternoon and circle the island in two to two-and-a-half hours, stopping at the three temples. I booked my tour at the Early Bird Hostel and paid 200 Baht ($5) incl. drop-off/pick-up. 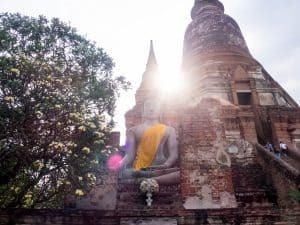 Ayutthaya seems to have so many great places to visit! I am saving the the buddha head in the tree! I have never seen or heard about but how cool and is it! And thanks for the reminder about the dress code! Yes! And it’s so easy to get to from Bangkok (or on the way from Bangkok to Chiang May). Happy travels! I absolutely loved this! I didn’t get a chance to go here when I lived in Thailand in 2012 and have always regretted it. Will have to go, as you convinced me its a must see when I make it back there! Lol! Sounds like me: When I live somewhere I always end up seeing less of a place than when I just visit for a few days…. Hope you get to go back and see Ayutthaya. It’s really special! Hope you get to visit Thailand some day. It’s a beautiful and unique country! 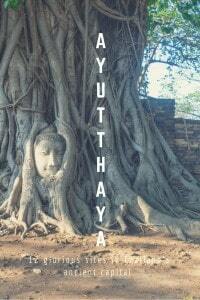 I am so sad we didn’t go to Ayutthaya when we were in Bangkok. We really need to go back not only to explore Bangkok more rather than just passing through like what we did but also to check out this beautiful place! I want to see that famous face in the tree roots! What a great list of things to visit. I usually tend to visit as many World Heritage Sites as possible when I travel because they’re always super interesting. This is not exception. Really interesting finding out a bit more about the history of the place. Couldn’t agree more! When I’m on the fence of visiting somewhere, seeing that UNESCO Heritage logo always makes me say Yes! I visited Ayuthaya, but that visit lasted just 6 hours or so. Seeing your post I realize how much more I could have seen. I have to attend the night market to eat thai food to my heart’s content. Hopefully I get a chance again. I hope you do! I love how easy it is to visit the city as a day trip from Bangkok or passing through on the train to/from Thailand’s North. But this also means missing some of the details. I love the idea of getting up at first light to enjoy Ayutthaya. I am a big fan of seeing the city as it sleeps, or before the crowds appear. It’s such a unique way to explore, plus you can get some beautiful photos that time of day! Yes! I’m not gonna lie: It’s always tough when the alarm pulls me out of a dream and it’s still darkish outside. But once I’m exploring I’ve never ever regretted forsaking some of my sleep. Although unlike most of the people, Thailand is not high on my bucket list, of course, I would love to visit it and I have to admit that there are really some amazing places to see there. Ayutthaya is absolutely beautiful! Last time when I was in Thailand, I didn’t get to see the historic side of the country. There’s so much history and beauty to this part of Thailand! Thank you for such an informative guide. I will need to plan another trip to Thailand soon! I love that about Thailand, though: It’s such a huge and diverse country that you can a dozen different visiting experiences — from cultured to religious to partied to relaxed to foodied… It’s an amazing country! Lovely post. I’d love to be up early to sneak into the temples! That morning light and feel would be magical in these beautiful buildings. I really like your tip on arriving there before 6am!! We couldn’t make to Ayutthaya because we were on a tight schedule for the Vipasana Meditation, but really wanted to. Well, I kinda felt I had just visited though. It was a very informative post. Thanks for that! By the way, very cleaver having your pictures as they are from Instagram. Thumbs up for that! Vipasana sounds interesting as well, though. So I understand… There is always next time!